Veteran AGWM missionaries Neil and Kathy Vanaria are no strangers to hard places and great challenges. For 25 years they served in the jungle-consumed mountains of Papua New Guinea, an ancient, untamed island nation north of Australia. Their work in PNG culminated in 2013, with the completion of a translation of the New Testament into the Mesem language. Since 2015, Europe has scrambled to respond to the arrival of millions of refugees and asylum seekers from the Middle East and North Africa. Each European nation has responded differently, resources are being exhausted, and in some cases, patience has worn out. To a great extent, the media has moved on, so awareness of the need has diminished. Yet for those desperate to escape war, famine, persecution and poverty in their home nations, the struggle is alive and well. As governments continue doing their best to cope with the continued crowds of new arrivals, AGWM missionaries across Europe are also stepping up to face what has been called one of the greatest challenges of our time. In 2016, just after the refugee crisis had gained momentum, the Vanarias transitioned to service in Sicily. They quickly recognized the plight of those who, upon initially landing in Sicily, felt tremendous relief in the belief that the horrors of war and their open-ocean voyage were behind them. That relief often gave way to despair and horror when they realized that wild promises made to them by human smugglers — including guaranteed income and free housing — do not exist. Many became trapped in a form of servitude, working with no wages. 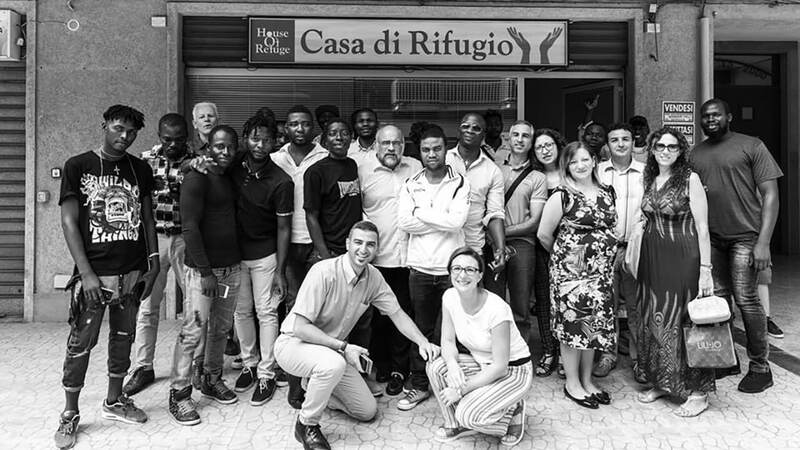 “Here in Sicily, we have opened two ministry locations under the name ‘Casa Di Rifugio’ (House of Refuge),” Neil and Kathy explain. “The first was opened in February 2017 and is located in the town closest to Europe’s largest refugee camp, Cara Mineo. We gather three times a week for prayer, discipleship, Bible study, praise and worship, Italian lessons, soccer and games. As a result of this crisis, and the response of missionaries like the Vanarias, people from nations where no one can freely share the gospel are now hearing about Jesus. In the past two years, the Vanarias have distributed more than 7,000 New Testaments in 40 languages among the refugee and immigrant population in Sicily. The Bibles (both as audio files and in PDF written format, whenever possible), a copy of the JESUS film, and other helpful resources are loaded on to SD (Secure Digital) memory cards, which can used on cell phones and other electronic devices. As the Vanarias leverage every available resource to serve and stand alongside hurting people within the very short window of time sometimes available for ministry, they have seen miraculous provision. A remarkable example of this came in 2017, with the anonymous donation of an SD duplicator. The duplicator has also allowed the Vanarias to provide an additional 1,000 copies of the Bible for personnel serving in French-speaking West Africa and to prepare SD master cards for Eastern European languages. Personnel serving with Project Rescue, AGWM’s ministry to victims of human trafficking, are distributing those Bibles among trafficked women from many different Slavic nations.